The final stage in this sort out of work books/documents concerns the seven volumes of proceedings of conferences on Computer Supported Cooperative Work that appear in the picture below. The first of these events was held in Austin, Texas, in 1986 and I was there to experience the excitement of a new field being born. It was a field which embraced the Cosmos project that I was participating in at the time, and a field in which I actively worked for the following five years. 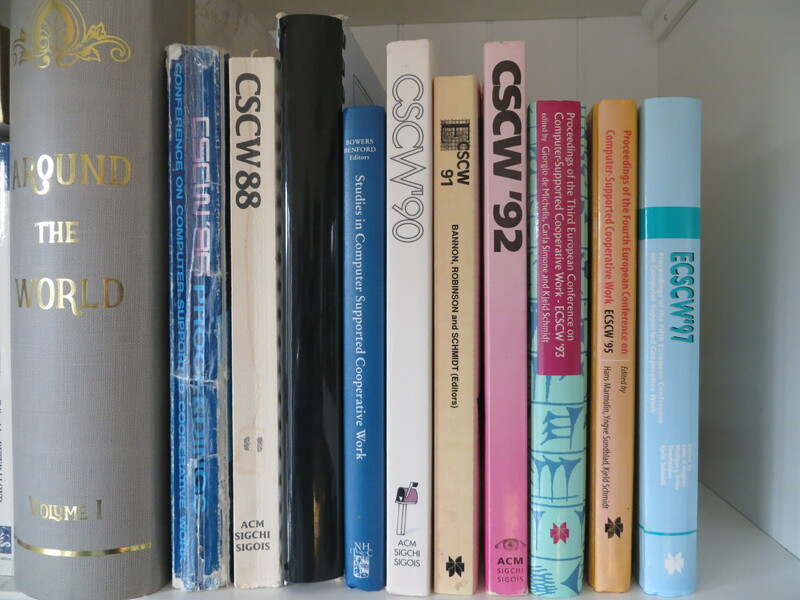 In 1989 I was to organise the first European CSCW conference, EC-CSCW89. Hence, I am particularly attached to the proceedings of both the 1986 and 1989 events, though the 1986 volume is in poor condition with the cover having come away, and the 1989 volume is spiral bound. So, I’ve decided to turn both volumes into hardback books and to incorporate some additional pages of related material in the process. As for the remaining 5 volumes, although I attended all but one of the events they document, I am unlikely to want to look at them in the future so have decided to digitise them and include them in my electronic bookshelf collection so that at least the covers and spines will be visible for decor and I’ll have the comfort of knowing that the text is immediately accessible should I want to take a look at it. This entry was posted in Keeping Work Stuff by admin. Bookmark the permalink.